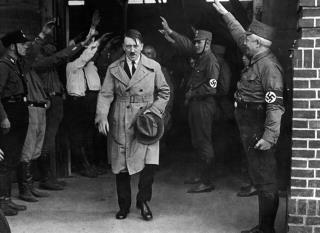 (Newser) – A snub appears to have led Adolf Hitler to the Nazi party. A historian is making the case that the most reviled dictator in history first tried to join the German Socialist party but was rejected, the Guardian reports. If the German Socialists, another far-right party, had taken him, Hitler may have settled for a more minor role in the party, which was larger than the Nazis, argues Thomas Weber. Since Hitler hadn't previously "shown any leadership qualities and had been happy to follow orders," Weber says he may not have ever risen to prominence. "The Nazi party would have been absorbed by the German Socialist party and thus would have disappeared and history would have taken a different path," Weber tells the Guardian. If that happened, it's unlikely there would have been World War II or the Holocaust, Weber tells the Independent. Coulda, shoulda, woulda and if pigs had wings they'd fly. Another attempt to white wash one of the worst dictators in modern history with the other candidate being Josef Stalin, who if he hadn't left the Seminary would have been a Russian Orthodox priest. This story has been picked up by Fox News and you have no way to comment there, this is how they spread the "Big Lie". MSM continues to perpetuate the Leftist rewrite of history. Did this idiot just call socialism "far right"?